Three times in the past decade I had the good fortune to travel to Germany in December. Each city and town we visited had its own Christmas Market and I loved poking around the wares in the stalls of the market vendors. My German molds are a mixture of Christmas/winter (snowman, Father Christmas, church, tree) and general (flowers, birds, fruit) in subject. The molds below are especially nice because the carving is deep and detailed. The mold below is one of my favorites. When I bought it I had no idea who it was or what it meant. Münchner Kindl is German for "Munich child", the symbol on the coat-of-arms of the city Munich. 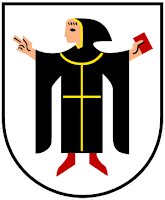 This symbol has been the coat-of-arms of Munich since the 13th century. The figure portrayed was originally a monk (or friar) holding a book, but by the 16th century it evolved in different portrayals into the figure of a small child wearing a pointed hood, often shown holding a beer mug and a radish. It has been theorized that the name for the city of Munich (München in German) comes from the term "Kloster von Mönchen" or "Cloister for Monks" due to the Imperial Abbey of Tegernsee--a Benedictine Monastery near which the original town of Munich was built. It took me a while to actually use my molds, though. The prospect was a bit intimidating; I didn't have a tried-and-true recipe, and I wanted the recipe to be as wonderful as the molds. In my mind, it added up to an Epic Project, and, as such, it never actually got started. Then I got my copy of the lovely baking book Tartine, and saw molded cookies on the cover. I knew it was time to try out my German cookie molds with the Soft Gingerbread recipe in Tartine. - Tartine's recipe for soft gingerbread can be found here, or buy the book! Of all the bakery cookbooks I've seen and baked from, this one's the best, and I highly recommend it. - Blackstrap molasses gets very little love, and I was glad to see it featured in this recipe. - This dough is perfect for rolling in a gallon ziploc bag. - The way that I found to work in shaping the cookies in their molds is to place the mold face down on the rolled dough, and cut around the outside with a bench scraper. Then turn mold over and press dough gently so it fits into the indentations. I've even rolled the back lightly with the rolling pin. The next step is to turn the mold over onto a parchment-lined baking sheet, remove mold, trimming as necessary with the bench scraper, before baking as directed. - The cookies puffed in the oven more than I expected, so some of the definition was unfortunately lost. - I didn't glaze the cookies with the optional glaze in the recipe because I prefer my cookies plain. - I also used this dough for gingerbread cookies made with regular cookie cutters and they came out beautifully. This recipe makes the perfect gingerbread cookies, either rolled/pressed into molds or rolled/cut with cookie cutters. The taste is fantastic, with the perfect balance of molasses and spices. I love working with this dough, and it has become my go-to gingerbread cookie recipe. The molded cookies lost more definition than I'd like, but with flavor this good, it's hard to care. 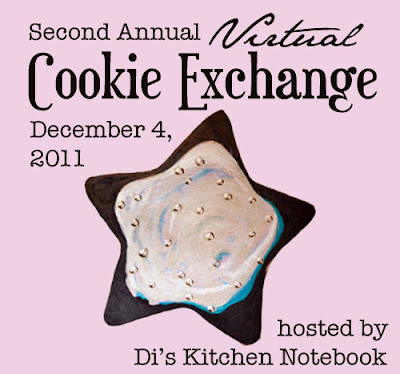 This cookie is my contribution to the 2nd Annual Virtual Cookie Exchange over at Di's Kitchen Notebook. Visit Di's blog in about a week to see a roundup of all participating blogs and delicious cookies, still in time for Christmas baking! I'll add that the cookie exchange badge was painted by my daughter Allison; if you need any form of custom art visit her website. An article in the December, 2008 Martha Stewart magazine featured molded cookies and included a recipe for Speculaas cookies, a spice cookie traditional in the Netherlands and Germany. The online reviews were very mixed, however, so I never baked that recipe. The source for Martha's cookie molds is House on the Hill (www.houseonthehill.net) I have ordered a couple of molds from House on the Hill to supplement my collection, and they are beautiful. If you have a Springerle rolling pin, you can use that to make molded cookies, cutting them apart either before or after baking. You can also find molds on ebay, or keep your eye open at the local thrift shop or antiques market. Your molds and resulting cookies are just lovely! I really like gingerbread and make it a few times around this time of year. I just ordered two boxes of KAF gingerbread mix; I'm anxious to see how it stacks up. Oh, this was such a fun post with all those beautiful molds! It would be such fun to have those and make cookies with them, your family is lucky that you create so many wonderful memories with your food each year. Lovely, just lovely. Those molds are amazing...I've not seen anything like them! The gingerbread sounds great. I've only tried one gingerbread recipe, and it wasn't amazing, so I will hopefully be able to give this one a try this year. Oh, and I love Allison's badge! How wonderful to have such a great collection of those molds. Baking with them sounds like fun. We made it to the market one time. I remember the lights SMS the smells. Wish I still had some of the ornaments we picked up. I've always wanted some Springerle molds and your wooden carved ones are so beautiful. I especially love the bird. Your cookies look marvelous and the way you described the taste of the soft gingerbread has me sold on trying this recipe and getting the Tartine book. I also enjoyed your photos of Germany. Gorgeous molds! I just visited a Weihnachtsmarkt in Münster, Germany, this Sunday. It wasn't very Christmassy though: temperatures were way too high! Lovely!!! Hi have a stamp that my neighbor gave me a few years ago.... I need to get it out! The cookies look wonderful - and SO vintage and traditional. What gems those are to have Nancy - and looks like you had a jolly time making them too. Gingerbread/cookies are the perfect 'go-to' cookie for the holidays! A wonderful Exchange submission! Well Nancy, thanks for sharing the beautiful molds from your lovely travels with us. How unique and interesting. Love that. Imagine the yummy gingerbread cookies and yes black strap isn't one of those common flavors of love. I happen to have grown up with it and found as a kiddo that it was the perfect compliment to hot buttered cornbread. Anyway, the Merriest of Christmas's to you and your family.